The title QWERTY comes from the first six letters on a typewriter or computer keyboard. 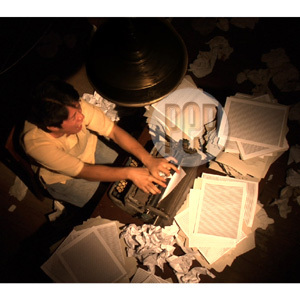 This typewriter is crucial in the plot of the five-minute film written and directed by Paolo Dy. Digital films and live band music comprise the line-up of an event scheduled for tonight, July 13, at Purple Haze Bar & Cafe in Quezon City. One of the films to be screened is QWERTY, a Filipino short film that competed in the first round of the Steven Spielberg/Mark Burnett reality filmmaking competition On The Lot. Written, directed and shot by Paolo Dy, QWERTY is a suspense-thriller. A mentally-afflicted young man is accused of murdering his longtime benefactor. The truth about what really happened lies in his mad obsession with his supposed victim’s old typewriter, on which he types relentlessly, day and night. Shot in only one day, the 5-minute short film features Filipino theater actors including Michael Williams, Miguel Faustmann, Cathy Azanza, Arvin Trinidad, Altair Alonso, Boyd Tinio, and Irra Cenina. Other digital short films to be shown are: The Revolution Will Not Be Televised by Kim Bartley & Donnacha O’Briain; Bunker-O by JP Carpio; Dancing Wounded Is by Waise Azimi; Angels on the Street by Mayk Juat; Iceland by Claudia Skaert; Literature by Khavn dela Cruz; Pedxing by Roel Cornejo; Salat & Tawid gutom by John Torres; and Rights, a 30-second film on human rights. There will also be live performances by Incidentals, King Antares, KontraLuz, Purple Chickens, Tabloid Lite, Tales of Doom, and Taggu nDios. This Eksena Productions presentation will be hosted by improv-comedy act Sasi Casas and Hector Macaso. Tickets, which can be bought at the venue, are priced at Php100 (with one beer).